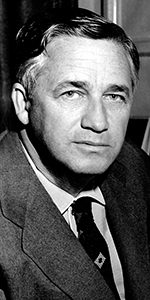 Mervyn LeRoy was one of the better-known directors and producers of films during Hollywood's Golden Age. Working in many different genres, LeRoy brought his considerable dramatic sense to all of his projects, and suffered relatively few flops. Born to Jewish parents who ran an import-export business, the family was financially ruined in the 1906 San Francisco earthquake. After his father's death in 1910, young Mervyn sold newspapers in front of a theatre, where he eventually won a bit part in a play. After winning a Charles Chaplin look-alike contest, LeRoy undertook working in films full time. Working in all departments of picture making, LeRoy became a wradrobe assistant in the early 1920s, and became a scenario writer mid-decade. Althought he does not appear to have worked with Cecil B. DeMille, LeRoy always credited the master with teaching him the techniques of directing for the screen. LeRoy's first feature was No Place to Go (released in October, 1927), then he directed the film adaptation of the comic strip Harold Teen (released in April, 1928) with Arthur Lake for First National, but before long, he was directing pictures at Warner Bros., where they appreciated his ability to stay on schedule and on budget. LeRoy was good with comedy, directing the likes of Joe E. Brown in Top Speed (released in August, 1930). LeRoy's breakthrough hit was the "gangster" picture Little Caesar (released in January, 1931) with Edward G. Robinson, which began a wave of imitators — but LeRoy did not make any of them. Instead, he directed Robinson again as a newspaper editor in the fast-paced Five Star Final (released in September, 1931). LeRoy's track record at Warner Bros. made him popular in the executive suite; in 1934, LeRoy would marry Harry Warner's daughter Doris; LeRoy and Warner would start a fairly successful horseracing stable during this time period. While at Warner Bros., LeRoy would direct films such as I Am a Fugitive from a Chain-Gang (released in November, 1932) with Paul Muni, Gold Diggers of 1933 (which played the Chinese in June, 1933), but also would get loaned out to direct at M-G-M, as with Tugboat Annie (released in August, 1933) with Marie Dressler and Wallace Beery. LeRoy would direct Anthony Adverse (released in August, 1936) with Fredric March before leaving Warners' to assume a post at M-G-M.
LeRoy's first project at M-G-M was to become the producer of a little show they made there called The Wizard of Oz (which played the Chinese in August, 1939). He directed films there as well, includeing Waterloo Bridge (played the Chinese in May, 1940) with Vivian Leigh, Blossoms in the Dust (released in August, 1941 with Greer Garson, Johnny Eager (released in January, 1942) swith Robert Taylor, and Random Harvest (which played the Chinese in December, 1943) with Ronald Coleman and Greer Garson. Rounding out the War Years, LeRoy directed Madame Curie (which played the Chinese in December, 1943) with Greer Garson and Walter Pidgeon, Thirty Seconds Over Tokyo (released in November, 1944) with Spencer Tracy, and produced and directed an Oscar-winning short film The House I Live In (released in November, 1945). After directing the Claudette Colbert / John Wayne rom-com Without Reservations (released in May, 1946), and the June Allyson version of Little Women (released in April, 1949), LeRoy directed the first of the 1950s spectacular money-machines, Quo Vadis (released in December, 1951). LeRoy directed a trio of successful musicals, Lovely to Look At (released in July, 1952) with Kathryn Grayson, the hugely successful Million Dollar Mermaid (released in December, 1952) with Esther Williams, and Rose Marie (released in March, 1954) with Ann Blyth and Howard Keel. Moving back to back to Warner Bros., LeRoy agreed to produce the film of Mister Roberts (released in July, 1955), and had to replace director John Ford after he and and star Henry Fonda had a falling out on the set. LeRoy's next film was the creepy thriller The Bad Seed (released in September, 1956) with Nancy Kelly. LeRoy's film of No Time for Sergeants (released in July, 1958) with Andy Griffith, influenced Griffith to develop Gomer Pyle, USMC in 1964. LeRoy directed The FBI Story (released in October, 1959) with James Stewart, then, the very strange (in a good way) A Majority of One (released in December, 1961) with Rosalind Russell and Alec Guiness (in yellowface). LeRoy's last great film proved to be Gypsy (released in November, 1962) with Rosalind Russell and Natalie Wood. He directed Debbie Reynolds in Mary, Mary (released in October, 1963), and his final film would be Moment to Moment (released in January, 1966). After trying to help John Wayne with his The Green Berets (released in July, 1968), LeRoy retired from pictures. LeRoy published his autobiography, Mervyn LeRoy: Take One in 1974. LeRoy died of heart failure at his home in Beverly Hills in 1987, at the age of 86. Grauman's Chinese Theatre, Hollywood, California. 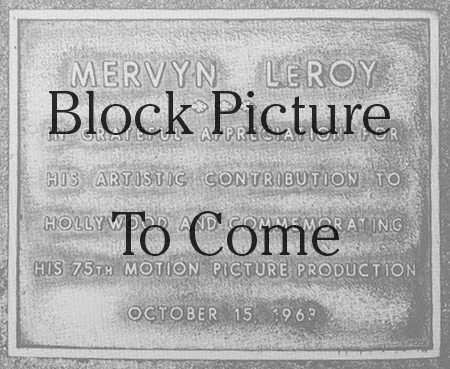 Mervyn LeRoy Forecourt ceremony, Tuesday, October 15, 1963. 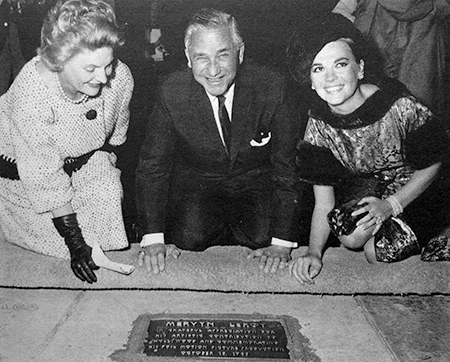 Wife Kitty LeRoy, Mervyn LeRoy and Natalie Wood oversee the installation of the plaque.